Goldpan Park was constructed in 1956 on the banks of the Thompson River, and it is still located there today. It is a convenient overnight camping spot for travelers on Hwy #1 and is a destination site for fishermen during peak fishing times. This is also a popular base camp for visitors enjoying guided river rafting, and exploring the Thompson/Pavilion area. It's an area rich in geological and human history. Gate is closed outside of these dates (during the winter season). The extremely hot, dry climate can result in overexposure to the sun. Everyone in your party should wear sunscreen of at least SPF 15, and a hat with a brim. The waters of the Thompson River are very swift, especially in June and July during high water. Use caution in and around the waters edge. Wood ticks are most prevalent between March and June. These parasites reside in tall grass and low shrubbery and seek out warm-blooded hosts. Although they are potential carriers of disease, they are a natural part of the environment and can be easily avoided. Your legs should be protected by wearing trousers tucked into socks or gaiters. After outdoor activity, thoroughly examine yourself. Check your pets for ticks as well. See the below Visitor Safety Information for more details regarding ticks. Quiet Hours – are 10 pm to 7 am. Music, generators, etc. must be shut off completely between these hours. Hibachis and Campstoves – can burn the picnic tables. Please do not use them on the tables. Valuables – when left unattended or at night, should be stored out of sight and locked up at all times. Please report all thefts to the park staff as soon as possible. Traffic Safety – The speed limit within the park is 20 km/hour or less. Motorcycles and Bicycles – are permitted on park roads only. Motorcycles must be properly licenced and must be operated by a licenced driver only. Helmets must be worn. Unlicenced ATVs or dirt bikes are not permitted. Parking – is prohibited on the side of the road. Please park on the gravelled portion of your campsite or in designated parking spaces. Vehicles parked in day-use areas after 11 pm may be ticketed or towed. Pets – must be on leash (no longer than 2 metres) at all times while in the park. They are not allowed on beaches or in day use areas. Owners must clean up after their pets. Consumption of Alcohol – is prohibited except in your campsite. 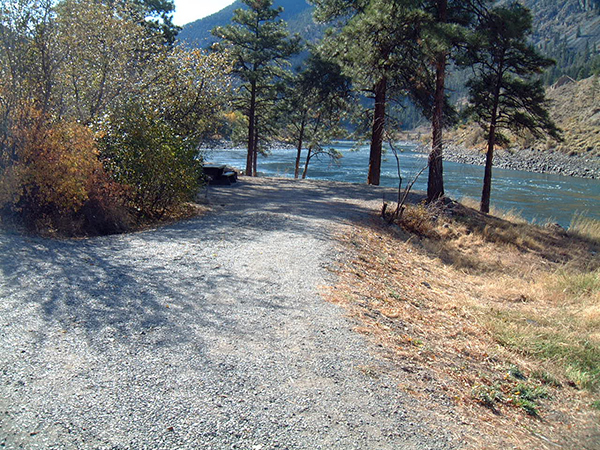 This park is located on the east bank of the Thompson River adjacent to Hwy #1, 10 km south of Spences Bridge. History: Established in 1956 the park provides access to the river for visitors. The Thompson Canyon area where Goldpan is situated is rich in history. The historic Cariboo Wagon Road passes through the area.The starting point of the road was in Yale and construction of the road took place between 1862 and 1865. The road was a narrow, treacherous track winding along the cliffs of the canyon and allowed stagecoaches and freight wagons access to the interior of BC. The road linked the gold fields of the Cariboo to Vancouver. Cultural Heritage: There is evidence of First Nations activity in the area in regards to fishing and using the river for a travel route. Wildlife: Fish species in the Thompson River include trout, steelhead, and salmon. Osprey can be seen flying over the river. The approved management plan for Goldpan Provincial Park [PDF] is available in PDF format. Kayaking and river rafting are popular activities on the Thompson River. Spences Bridge provides an opportunity for put in for rafts and kayaks. The Thompson River contains trout, steelhead and salmon. There is 600 metres of river frontage. Anyone fishing or angling in British Columbia must have an appropriate licence. The waters of the Thompson River are dangerously swift, especially in the high water of June and July. Use caution and watch children in and around the river’s edge. During lower water levels, visitors will swim in shallow areas, but caution needs to be used as the water is swift flowing. The beach is made up of mostly large rock. There are no lifeguards on duty at provincial parks. There is no viewing platform but in the Spences Bridge area, California Bighorn sheep can be observed on the surrounding hills. No campfires allowed in the day-use area. Ensure that barbeques or campstoves are used on the ground, not set on picnic tables. There is a potable water handpump located next to the information shelter. Water used from the river should be treated or boiled before being consumed. Day-use facilities are located at the entrance to the park adjacent to the highway. There are seven picnic tables. This day-use site overlooks the Thompson River. There is no shade provided at this site. There are four pit toilets located within the campground – no flush toilets. Goldpan has 14 camping sites on a first-come, first-served basis. Each site is situated above the river bank and provides a view of the river. These sites are small to medium in size and can accommodate tents, campers and medium sized trailers. Large camping units will have trouble maneuvering the roadways of this small park. There is a turn around at each end of the park allowing a limited turning radius. Most sites are provided some shade, depending on the time of day. There are two double campsites. During July and August this is a very popular campground and begins filling up by 4:00 to 5:00 in the afternoon. The gates at Goldpan are not closed at night. The closest store is located at Spences Bridge, 10 km north. During the camping season, overnight visitors can now pay at the campground with a self registration system – cash only accepted. Deposit cash in the envelope (change will be provided when attendant arrives if you do not have correct amount), fill out the information and place in the vault provided at the information kiosk. Please detach the receipt portion and attach to the campsite number post. You may also pre-pay for firewood with your campsite self registration. Staff will be at the campground at least once a day during the camping season.